Extremists in Congress have introduced six — yes, six — bills that would slash all funding for NPR, PBS and other public media.Now, they're rushing the issue to a vote, trying to pull the plug on the news, arts and educational programming on which more than a hundred million Americans rely. The vote to cut all funding could happen as soon as next week! It's a disgrace to see the extremes to which members of the "People's House" will go to silence what the public says, in poll after poll, are their most valued sources of news and programming. These outrageous political attacks need to stop. The proposed bills would zero out the $430 million federal appropriation for the Corporation for Public Broadcasting — a cost that averages a mere $1.39 per person. By comparison, we spent approximately $19.40 per capita to subsidize ethanol production in 2010. More than 70 percent of that funding goes to local stations around the country, providing the lifeblood for broadcasters in rural or economically hard-hit areas where there are fewer sources of news and programming. Public media have become a vital resource for Americans at a time when commercial journalism is in decline: U.S. print newsrooms have shrunk by 25 percent in the past three years alone. Local television stations have lost more than 1,500 jobs since 2008. In some parts of the country, public media are the only source of local news and public affairs programs. First, sign on to this letter for your member of Congress. Once we get enough signatures from your district, we'll deliver the letter to your representative. After that, we'll begin a call-in campaign urging your rep to stand with the American people against political efforts to undermine popular programs like PBS NewsHour, Frontline, Point of View and On the Media. Public pressure works. On Tuesday, Rep. Steve Rothman (D-N.J.) said, "It is critical that Congress continues to support funding for the Corporation for Public Broadcasting... Defunding CPB will significantly hurt National Public Radio news stations in less affluent areas because those communities rely on the vital federal funds set aside for public broadcasting." We need to encourage more elected officials to join Rep. Rothman. 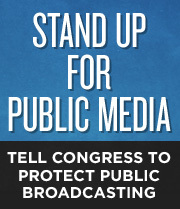 By signing this letter, you're putting Congress on notice: Don't play politics with public media. P.S. In an era of media consolidation, fewer national and foreign bureaus and mass newsroom layoffs, NPR is one of the only media outlets actually bringing listeners more reporting from around the country and around the world. Despite its fulfilling that important need, the United States spends a mere pittance on public media, compared to other industrialized countries. P.P.S. Public broadcasting is local: Stations are locally licensed and governed, locally programmed, and locally staffed. They are part of the communities they serve, and understand the needs of the people in their audience. In many rural areas, public broadcasting is the only source of free local, national and international news, public affairs, and cultural programming.